These are my secret weapon for keeping people coming back to my trail work days. The butter and heavy mixing are the keys to getting the perfect consistency, and I've got the science to back that up! 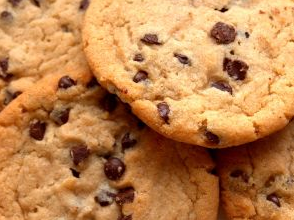 The taste comes from the real butter and using good chocolate chips, not the generic ones packed with vegetable oil. Makes 20 to 30 cookies. Put the sugar and butter in a bowl, and mix thoroughly. The initial mixing is crucial, you should get a mixture that seems almost whipped by the end, that will form peaks when you lift the beaters. Start off with the butter cold, straight from the fridge, and mix for longer than seems necessary, it makes a big difference. Add one egg, and the vanilla, and mix thoroughly again. Though for a much shorter time than the initial mix. Add the final egg and mix again. In a measuring cup, combine the salt, soda and flour, giving them a stir. Add the flour to the dough, about a third or a quarter of it at a time, mixing well between each. Pour in the chocolate chips, and mix them in with a spoon. Take a baking tray and place lumps of dough a little smaller than golf balls on it. Line it with foil first if you want to make cleaning up easier. Place in the oven, and cook for 11 to 13 minutes, depending on how gooey you like them. Use a spatula to take them off the tray, and put them on a rack to dry. Don't worry if they're still a bit soft, they continue baking and firm up as they cool off.